Roasted Herbed Beef Tenderloin | Om nom nom! 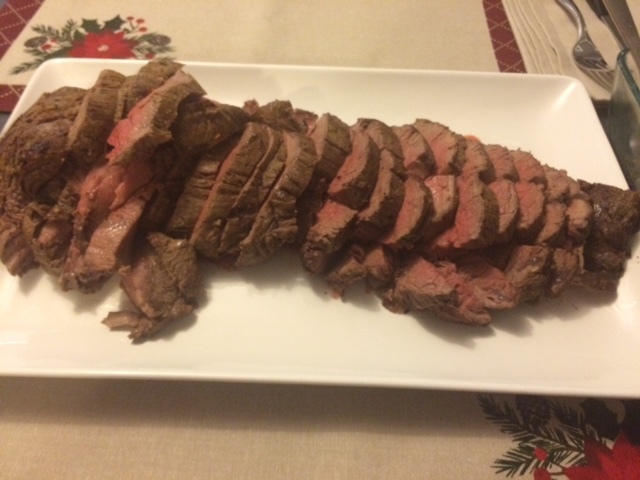 We decided on roast beef tenderloin for Christmas dinner this year, and we were VERY happy with the results. I didn’t do much to it – it stood out on its own for sure. A little compound butter and in it went for what I would say was by far the best Christmas dinner I have ever done. We’re swimming in leftovers, but I’m not complaining. This method came from Chow. Heat the oven to 400°F and arrange a rack in the middle. Pat the beef dry with paper towels. (If one end of the beef is noticeably thinner than the other, tuck the thinner end underneath and tie where you tucked with butcher’s twine. This will help it cook more evenly.) Using your hands, rub the tenderloin all over with the oil, sprinkle with the salt and pepper, and rub until evenly coated; set aside. Heat a large frying pan over medium-high heat until just starting to smoke. Place the beef in the pan and sear, turning occasionally, until golden brown all over, about 10 minutes. Transfer to a 13-by-9-inch baking dish and set aside until the surface of the beef is no longer hot, about 15 minutes. Meanwhile, make the butter mixture. Place the butter, garlic, rosemary, and thyme in a medium bowl and smash with the back of a spoon or a rubber spatula until evenly combined. When the beef is ready, evenly rub the butter mixture on the top and sides of the tenderloin.